^ a b c d e Sedley, David (2011). "Epicurus' theological innatism". In Fish, Jeffrey; Sanders, Kirk R. (eds.). Epicurus and the Epicurean Tradition. United Kingdom: Cambridge University Press. pp. 29–30. ^ a b c d Konstan, David (2011). "Epicurus on the gods". In Fish, Jeffrey; Sanders, Kirk R. (eds.). Epicurus and the Epicurean Tradition. United Kingdom: Cambridge University Press. pp. 53–54. ^ Buchheit, Vinzenz (2007). "Epicurus' Triumph of the Mind". In Gale, Monica R. (ed.). Oxford Readings in Classical Studies: Lucretius. New York, NY: Oxford University Press. pp. 110–111. ^ Asmis, Elizabeth (2009). "Epicurean empiricism". In Warren, James (ed.). The Cambridge Companion to Epicureanism. Cambridge University Press. p. 84. ^ Konstan, David (2011). Fish, Jeffrey; Sanders, Kirk R. (eds.). 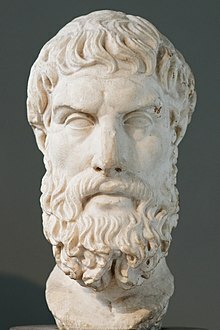 Epicurus and the Epicurean Tradition. Cambridge: Cambridge University Press. pp. 62–63. ^ a b c d Asmis, Elizabeth (2009). "Epicurean empiricism". In Warren, James (ed.). The Cambridge Companion to Epicureanism. Cambridge: Cambridge University Press. pp. 93–94. ^ Asmis, Elizabeth (2009). "Epicurean empiricism". In Warren, James (ed.). The Cambridge Companion to Epicureanism. Cambridge University Press. p. 85. Long, Roderick (2008). "Epicureanism". In Hamowy, Ronald (ed.). The Encyclopedia of Libertarianism. Thousand Oaks, CA: SAGE; Cato Institute. p. 153. doi:10.4135/9781412965811.n95. ISBN 978-1-4129-6580-4. LCCN 2008009151. OCLC 750831024.